Missing one or more teeth can be difficult. It not only affects the way your smile looks, but it can also impact how you bite, chew, and speak. Replacing your missing teeth is important both to protect the natural teeth you still have and to regain your ability to eat and talk. Dentures provide an easy way to compensate for multiple missing teeth, and they don’t require surgery or dental bridge work on your remaining teeth to help you enjoy your full smile again. What are full and partial dentures? Dentures are prosthetic teeth that are attached to a gum-colored plastic base. Advancements in technology have enabled dentures to appear natural and feel more comfortable than ever before. 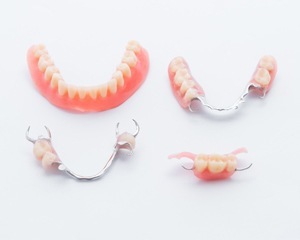 There are several kinds of dentures. One type is called a partial, because it only replaces some of the teeth with one or more natural teeth still remaining in the mouth. When every tooth in the mouth needs to be restored, it is called a full denture. Some dentures are removeable, held in place by suction or metal clasps, while others are permanently anchored to the jaw bone with surgically placed dental implants. Dentures provide a way for those who are missing one or more teeth to enjoy full function in their smile again. Even if you’re not a good candidate for dental implants, chances are that removeable dentures can be a good fit for you and your situation. Obtaining dentures starts with a consultation with Dr. Franzen, who will review your restoration options with you. 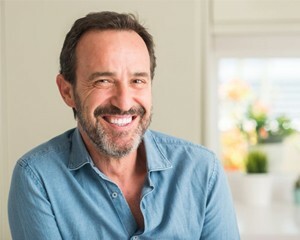 Once you’ve agreed on dentures, he will create a personalized design for your restored smile to ensure that your bite feels as natural and comfortable as possible. He will also take impressions and measurements of your mouth and send all this information to a dental lab, where your dentures will be custom made to fit you. Brush them at least once daily. Remove and rinse them especially after eating. Clean your mouth after removing your dentures with a soft-bristled toothbrush or gauze to clean your tongue, roof of your mouth, gums, and cheeks. Soak your dentures overnight according to Dr. Franzen’s instructions. Visit the dentist for regular dental checkups, even if you have no remaining natural teeth. Avoid using abrasive cleaning materials, bleach products, hot or boiling water, and whitening toothpastes on your dentures. Dr. Franzen is a prosthodontist with decades of experience helping patients restore their teeth. 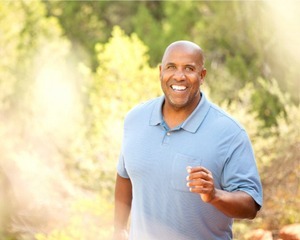 We at Milwaukee Dental Implants look forward to helping you regain your smile’s function and appearance with full or partial dentures. Contact us to schedule a consultation with Dr. Franzen today!